This book contains twelve chapters written by both senior scientists with international fame and young researchers who have been working at the frontiers of related fields for some years. It covers a variety of the most active research areas in rare earths research in recent years. The first five chapters concern a few hot topics on lanthanum photonics and luminesce&#65292; such as, new developments of EDFA (erbium-doped fiber amplifiers) techniques, the problems remaining to be solved and a few possible solutions proposed; the technology of lanthanum photonics for solar energy cells; Zr-Er co-doped optical nano-glass fibers that can be used for multichannel amplification and four wave mixing; rare earth doped lead phosphate glasses for which luminescence peak wavelength, line-width and lifetime etc., have been determined with sophisticate experimental techniques; optical sensing of femtosecond laser spot temperature using Er3+ doped TeO2-based glass; and the optical properties of rare-earth centered organic complexes with pyrazol substituted 1,3â€“diketones. The following two chapters probe the physics behind the phenomena, which some theoreticians may be interested in. The first one makes thorough studies on an exotic phenomena, valency fluctuation occurring in metallic perovskite compounds due to the joint influences by both Ce and Eu elements inside. The latter demonstrates, with an example, how a novel ab initio method can be employed to calculate crystal parameters more accurately and efficiently. 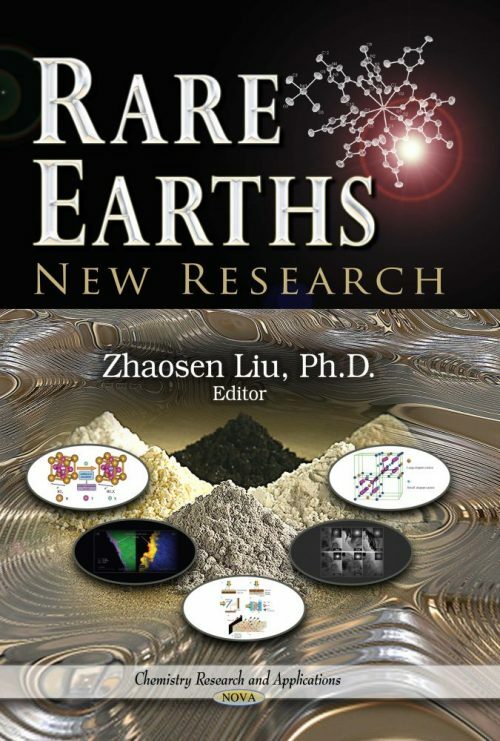 The final five chapters focus on the researches aimed at finding new applications of rare earths in industry and high technology based on their magnetic, chemical and electrochemical properties, such as, the magnetocaloric effects and performance in magnetic refrigeration of a class of amorphous materials containing heavy rare earth elements; the mechanism and applicability for rare earths to replace chromates as corrosion inhibitors; studies employing a defect cluster model to understand local ordered defect structure formation in doped ceria, and the possibility of using it to optimize the rare earth dopant in ceria for the purpose of improving the ionic conductivity of fluorite oxides&#65307; and fabrication and characterization of new Laâ€“Mgâ€“Ni electrode alloys by doping them with lanthanides to improve the electrochemical cycle stability and discharge capacity.